Coral bleaching is a common response of a coral under stress, and isolated colonies or small patches of bleached coral are not necessarily cause for concern. 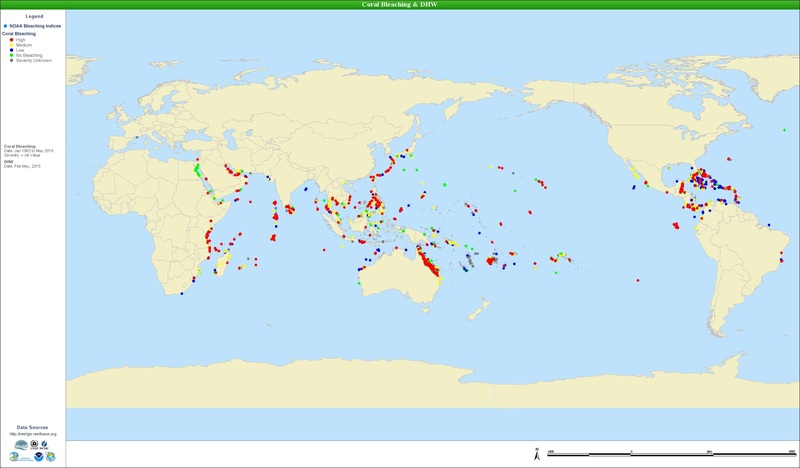 However, mass bleaching events that span tens or even hundreds (and sometimes thousands!) of kilometers can affect entire ecosystems and are a significant cause for concern for coral reef managers and stakeholders. 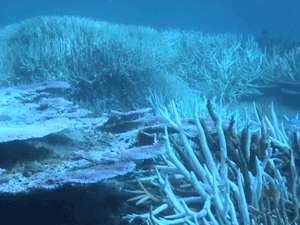 Bleaching severity can vary across a reef system, even within a mass bleaching event. A range of factors will influence the timing and severity of bleaching, especially at the scale of individual reefs or areas. While high water temperature and bright sunlight are the primary triggers of mass bleaching, calm and clear conditions with minimal current can exacerbate the stress and intensify bleaching. Lack of wind and currents may result in less mixing of water layers, clearer seas, and deeper penetration of solar irradiance (i.e., the amount of light that penetrates the water column). The response of a coral community to stress also depends on the condition (pre-existing stressors) of corals and the abundance and composition of corals. Reefs dominated by resistant coral types may bleach less severely, or bleach later, than reefs dominated by susceptible species. Factors that reduce these stressful conditions, such as cloud cover, strong winds, or tropical storms may be enough to protect the corals from bleaching. Whether a reef bleaches during warming events depends on a variety of factors, both physical and biological. However, the strong link to temperature provides a reliable basis for predicting the probability and timing of mass bleaching events. Degree heating weeks (DHWs) are a metric used by NOAA’s Coral Reef Watch program to help coral reef managers worldwide monitor bleaching risk. Because coral bleaching risk is determined by both the size of the temperature anomaly and its duration (i.e., how far the temperature is above the bleaching threshold and how long it has stayed above that threshold), degree heating weeks (DHWs) are used to represent the accumulation of thermal stress for corals. One DHW is equivalent to one week of sea-surface temperatures one degree Celsius greater than the expected summertime maximum. Two DHWs are equivalent to two weeks at one degree above the expected summertime maximum or one week of two degrees above the expected summertime maximum. 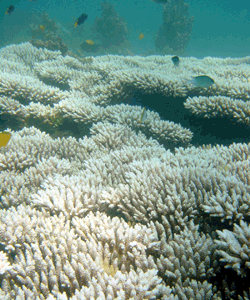 At 4 DHWs, conditions have become stressful for corals, and bleaching events become likely. Severe stress and possibly mortality is likely to occur at 8 DHWs or greater. Click here for information on monitoring and managing bleaching events.